Most people know Republic Services for the big blue trucks that collect trash throughout their neighborhood. But we don’t just deliver garbage to the local landfill, we also work to keep some things out – such as perfectly edible food. Supermarkets and restaurants often are left with food that’s beyond the “sell by” date but is still safe for consumption. At the same time, hunger is at epidemic proportions in the U.S., affecting one in six Americans. So our team got to thinking . . . how could we help get that extra food to those in need? 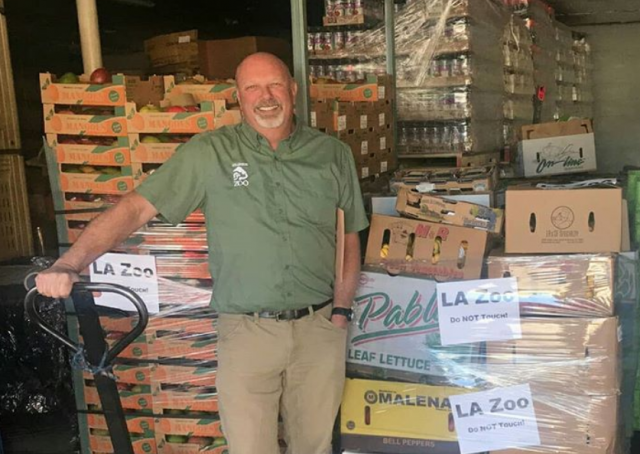 In Southern California, Republic teamed up with Food Finders, the St. Francis Center and World Harvest to pick up this surplus food and deliver it to local food banks and soup kitchens. In fact, in less than two years, these partnerships have recovered 1 million pounds of food, or enough for more than 800,000 meals. But that’s not all. Despite these efforts, World Harvest still had tons of surplus fruits and vegetables going to waste each month. Our L.A. employees wondered, was there a place to take this fresh produce where we knew it would be quickly consumed? The Los Angeles Zoo provided the answer. World Harvest is now donating 10 tons of fresh produce every month to feed the zoo’s animals. Not only is this reducing food waste, but it’s saving the zoo $16,000 a month in groceries! Any other food that World Harvest is unable to distribute to families or animals at the zoo is now sent to be composted by Republic Services. About 40 tons of spoiled or damaged food per month is turned into a nutrient-rich soil additive. Through the zoo donations and composting, Republic has helped World Harvest reduce its landfill waste by 80%. “We are proud of the work these partnerships have accomplished so far, and we know there is still much work to be done. We intend to continue to do our part to help fight hunger and divert food waste in Los Angeles,” said Tania Ragland, Sustainability and Food Recovery Manager at Republic Services. For more on Republic Services’ sustainability initiatives and our 2017 Sustainability Report, go to republicservices.com/sustainability.